We have always been big fans of the zoo. Clint and I went before we had kids, and when Leighton was little we lived just a short few minute drive from there and went often. It was easy when he was little, he stayed in the stroller and we walked and talked. Looking back I realize he probably could have cared less at 3 months of age where we were or if there was a zebra in front of him or not, but we went anyway. 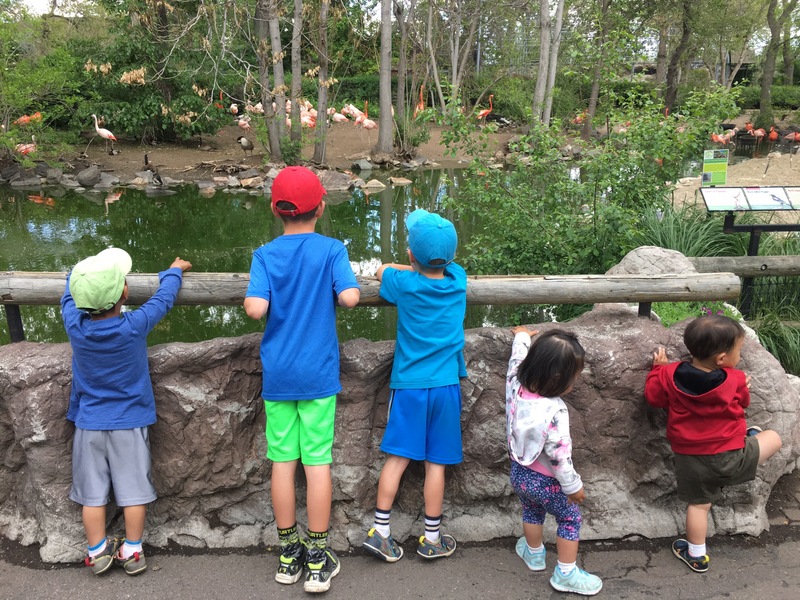 We’ve continued to go to the zoo through the years as we’ve added kiddos to our family. I think everyone has been within a few months of either being born or joining our family. This past Friday we decided to make it a zoo day. Members get in early, at 8:30, during the summer. My goal was to make it there by then. But in reality I thinks we walked through the gate a few minutes before 10, because…well life is a little different with 5 little ones. And we made the mistake of telling Edric that we would ride the train and so I’m pretty sure about every 3.5 minutes he asked us if it was time to ride the train yet. Paxton was pretty convinced that every animal was a “puppy”. Pretty sure that’s because that’s the only animal he knows how to say, but you know many of them had 4 legs and a tail like a puppy so he was kind of close…. We lucked out and it wasn’t too hot or too cold. 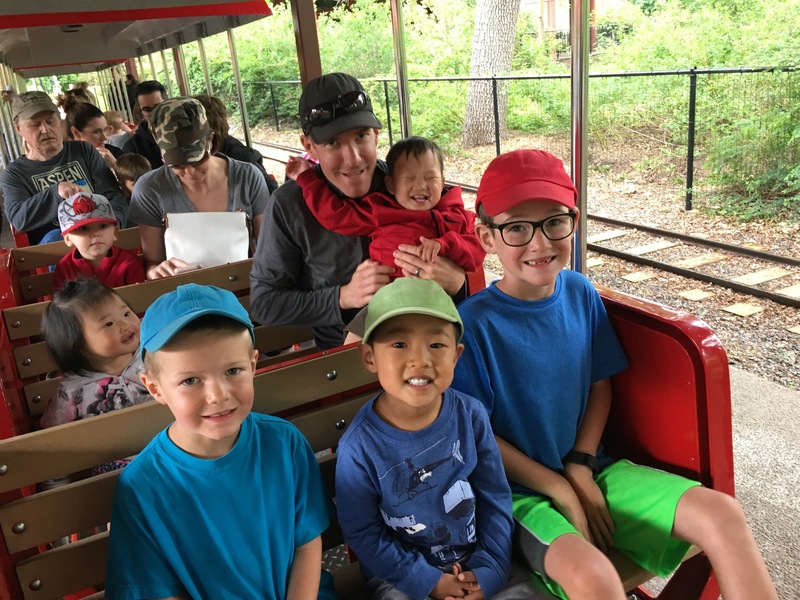 The highlight of course was the train, although I’m pretty sure the carousel was a close second….even though we were there to see animals. On our way home I again made the mistake of saying that we would get root beer floats at the A&W in our new little town, so while everyone else took naps in the van, Edric asked about every 2.5 minutes if it was time for “root beard floats”. Clint tried to explain that it was not beard…but to no avail. Oh well. We all enjoyed the treat when we got there. We finished the day with lightening a fire in the fire place outside at our new house and roasting hot dogs. We got home at 4:05 and by 4:10 the boys (and maybe Coppelia but I don’t think she offered much help) had all our chairs set up and the little picnic table with glasses and plates for everyone at the outdoor fire place. I had a hard time convincing them that it would be another hour before we would even start the fire since they were so excited. 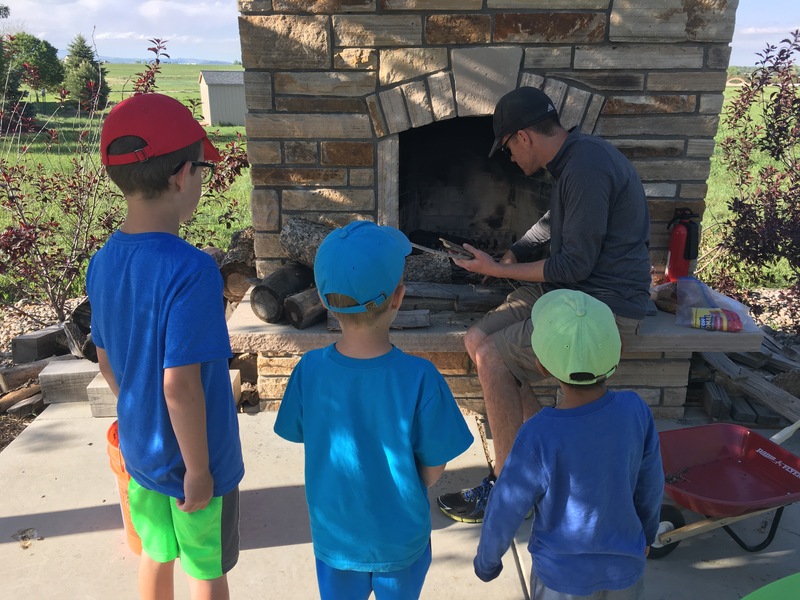 Luckily we were able to get the fire started and we enjoyed our hot dogs and apple slices (I ate all the marshmallows last week (as well as the chocolate bar) so smores were not an option-oops). Previous Post Paxton-2 Months Home!